With the air cargo business now touching US$80 billion globally, and more freight moving on to “main deck” freighter aircraft, the “intelligent cargo airline” is here to provide a bespoke offering to serve this trade. 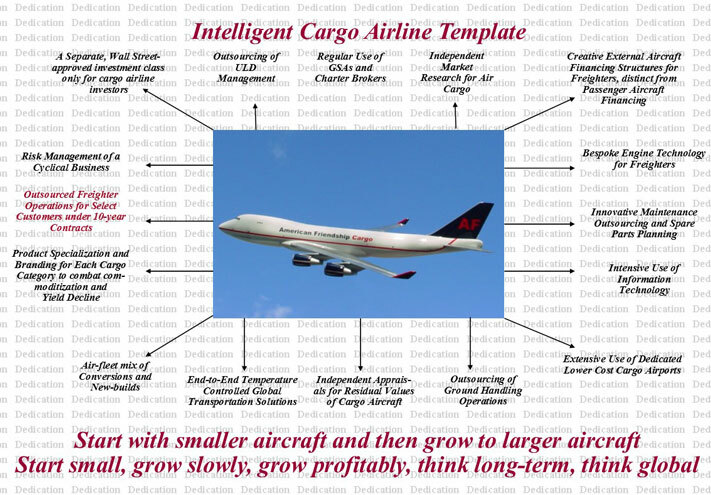 The value proposition of an “intelligent” cargo airline. To steadfastly promote the business case for all airlines, integrators, freight forwarders, shippers and government agencies to “outsource” the operation of all cargo aircraft to specialized “main deck” freighter aircraft operators. To encourage stability, innovation and eventually cost savings, promote the move towards very long term contracts of 10-12 years or more among shippers and forwarders. To de-risk “long term” contracts, encourage the introduction of “micro/Nano contracts” of as little as “one kilo segments” which allow for risk diversification and mitigation. Leverage the use of information technology to aggregate and consolidate these contracts and trade them on exchange. Encourage the movement of cargo aircraft financing away from traditional passenger aircraft financing structures such as finance and operating leasing, towards “tradable forward micro-space contracts”. Pioneer the creation of a tradable marketplace for these bespoke financing structures. Work with aircraft manufacturers and conversion companies towards creating more efficient and dedicated aircraft for the air cargo business, while at the same time re-designing newer passenger aircraft for passengers and their bags only, and not for freight. Promoting the use of “lower cost” dedicated cargo airports as a long term solution for all types of cargo, and for dedicated freighter aircraft only. Working with Wall Street research analysts to create a separate set of metrics and a distinct investment class for the air cargo business. This transparency will eventually create a path for venture capital and institutional funding to enter the air cargo business. Encourage these players to sharpen their game, by studying the dynamics of each type of air cargo product and air cargo customer, and promote specialization, branding, and product differentiation in the transportation and handling of each product category. Develop a seamless transportation chain for air cargo, including “end to end” Temperature-Controlled Global Transportation Solutions. Work with MRO’s and parts suppliers under “long term contracts” to create bespoke parts and maintenance manuals and procedures more in tune with the unique operating cycles of dedicated cargo aircraft. To promote freighter aircraft as valuable long term assets among the investing community, work with aircraft appraisers and valuation agencies to develop newer standards for dedicated freighters, both new builds as well as conversions. Explore and expand partnerships with IT solutions providers to streamline and optimize all processes in airline operations as well as across the supply chain. Develop new standards for cargo ground handling, and encourage technology up gradation through the provision of “longer term” contracts. In this website we intend to identify and study each and every aspect of the all-cargo business and the business of running a modern day cargo airline. We will identify and develop expertise in each of these areas, with “white paper” contributions from the best minds in the business, to raise the bar of intelligence and knowledge in this business. © 2011 American Friendship World Air Cargo Corporation. All Rights Reserved.